Feet and basements, they like to be dry. It’s getting rainy and cool. Basements can take on a little moisture this time of year. The rain comes pretty often and soon will be in the form of slow melting snow. Cooler weather and less sunlight means a lot of this water will soak into the ground. This is good for the water table where we pump a lot of our water from. It’s also challenging to basements and foundation walls. Poured basement walls free from cracks do a pretty good job of holding water back. It usually moves to a drain outside the footing and runs away from the house. Even antique houses have clay pipe drains around the foundations. A few of them are inside the basement footing. A lot of homes have drains that lead to a sump pump where the water is collected and pumped up and out the basement into a pipe that lets the water run out onto the lawn or a rocky area. Even with all this going on moisture can build up in the basement. Foundation walls, especially cinder block walls, become saturated and sweaty. Stone wall foundations are fairly porous and without good drainage in the landscape water will seep through. The basement gets muggy. This would almost be ok, except there’s usually a lot of stuff in the basement. Personal items. Storage. These things soak up moisture. I’ve heard too many times about photos, documents, books and old vinyl album covers being damaged after long storage in the basement. Clothing and cardboard soak up moisture too. Here’s a few things you can do this fall to significantly reduce this issue. Start outdoors. See to it the landscape drains away from the foundation walls all the way around the house- at least 3-5 feet. Gutters should not flood over and downspouts should be extended 3 feet our more out to the yard. Driveway and stairwell drains should not allow water to collect at the base of the doors. Once in the basement move all your storage to the center of the basement leaving a 3 foot space along all the walls. I know, this sounds crazy, it’s opposite of what most people do. We love to push all out stuff up against the wall and have a big open space in the middle. That’s fine, except all that stuff against the wall is closest to the moisture, and, reduces air movement. Organize your shelving in the middle of the basement, like a library. If your basement walls are stone or cinderblock they will be easier to observe and maintain when an “aisle” is located along all the walls. When maintenance is needed, you won’t be spending all weekend trying to move your storage away from the wall. Windows will be easier to access too. Invest in a good dehumidifier and put it as close to the floor drain as possible. Install it with a hose attached to the outlet so you don’t have to empty the water collector. You’ll never get enough water out of the air even if you empty the collector every day. Put the drain hose on. Set the humidifier so it comes on automatically. If it is the kind that shows a percentage of humidity set it at about 45%, if it comes with a 0-10 setting, put it at about number 8. Then at the most opposite side of the basement, set an oscillating fan on the floor. Turn it on and let it run. The fan will keep the air moving constantly. 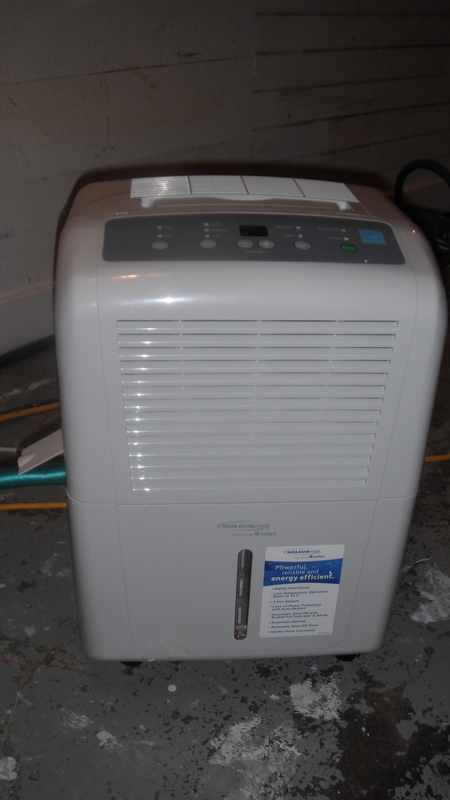 Since the walls are now clear the air will move along the walls and push the moisture toward the dehumidifier. This setup will significantly reduce moisture in the basement. Your belongings will be fresher and last longer. The basement will smell better and be more pleasant to spend time in too.